Philip Seymour Hoffman playing the washed-up salesman, Willy Loman, in “Death of a Salesman,” is all the rage on Broadway. But when I saw the play recently, it was Biff who got me thinking about young adults today. In the Arthur Miller classic, Willy anguishes over son Biff’s failure to hold down a job in the city. But the irony is that Biff, played by Andrew Garfield, probably did very well for himself after leaving Brooklyn for Texas. I imagine he became an oil baron or wound up owning substantial real estate in downtown Houston. Young people graduating from high school or college today don’t have the virtually unlimited opportunity that existed in the 1940s when Miller wrote the play: the personal drive to find a job and establish a career is not enough anymore. Young graduates who sign up for unpaid internships and double up on college degrees are well aware of this. Retirement: Getting by on Social Security from Squared Away on Vimeo. Before retiring, James Gomes said he often wasted his regular paychecks from General Electric. Arlene Starr wishes she’d saved – like her sister did. And immigrant Trung Quang Pham’s low income made it tough to set money aside. They are residents of the Savin Hill Apartments in Boston, most of whom are “pretty much on fixed incomes,” said apartment manager Sandra Baker of CMJ Management Co. They are not alone either. 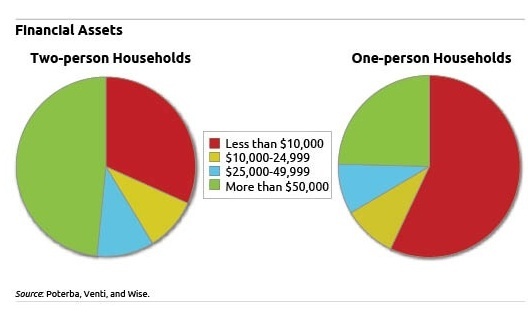 Millions of retirees rely on Social Security’s fixed monthly pensions, which average $1,181. The federal pension program provides the vast majority of retirement income for nearly one in four retired couples and nearly half of the elderly living alone. And new research for the first time determined that a large swath of the elderly leave this world with little or no assets left in savings and personal retirement accounts.